This winter, The Kitchen Studio at Pine Street is participating in a community initiative organized by The Land Conservancy for Southern Chester County. We are collecting gently used boots and NEW socks for The Land Conservancy’s post-holiday collection drive. Donations will go to La Comunidad Hispana in Kennett Square and Oxford Area Neighborhood Services Center. 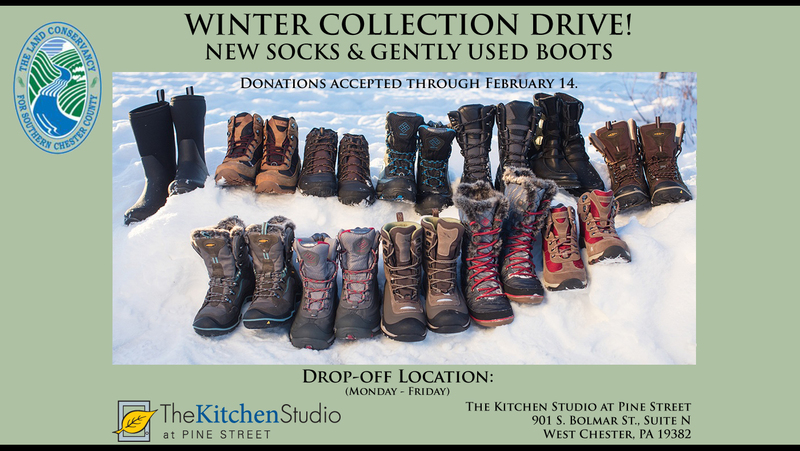 To donate gently used boots or new socks, please drop them off at The Kitchen Studio at Pine Street between 8AM-5PM, Monday through Friday. Donations will be accepted through February 14. Our showroom is located at 901 S. Bolmar St., Suite N, West Chester, PA 19382. Thanks for your support of this wonderful initiative from The Land Conservancy for Southern Chester County.